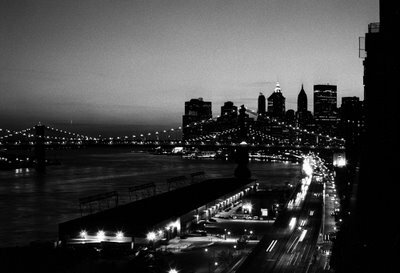 Back in July I was asked by an acquaintance of mine to bid on a time lapse job down at the South Street Seaport. The company that he works for, Obscura Digital, specializes in immersive, interactive multimedia environments for marketing events. One of things Obscura does is build planetarium-like domes that utilize sophisticated projection equipment to create 360-degree viewing experiences. 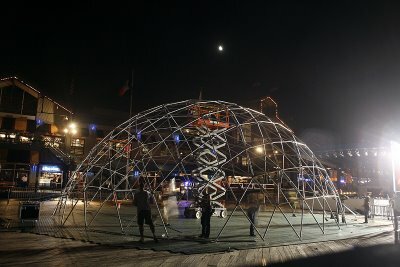 Over the course of four days, the dome at the Seaport was host to a marketing event in which Canon was unveiling a new point-and-shoot camera. 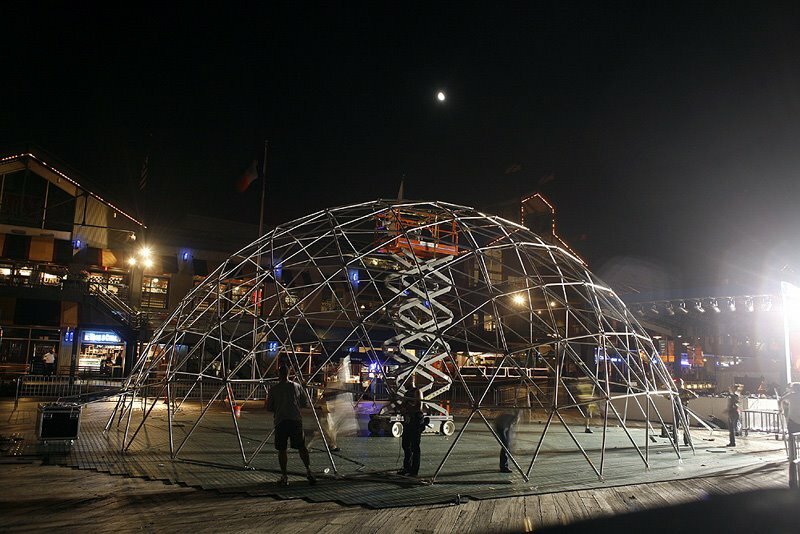 My job was to do time lapse of the dome going up and coming down as well as some photography of the event itself. But I had never done time lapse before so I had to put myself through a crash course. I started by tethering my camera to my laptop and using some software to trigger the camera. But the clumsiness of that whole setup totally ruled that idea out. So I went to Adorama to pick up a Canon TC-80N3 remote controller. Immediately, I could tell it was a Godsend. The device is an intervalometer that triggers your camera at any interval of your choosing. Basically you just set it and walk away. After a few days of experimentation with the TC-80N3, I felt ready for the Obscura job. My first night down at the Seaport I arrived around 7:30 and we put my camera up high in a manlift. I set the intervalometer at one picture every 60 seconds and that was that. 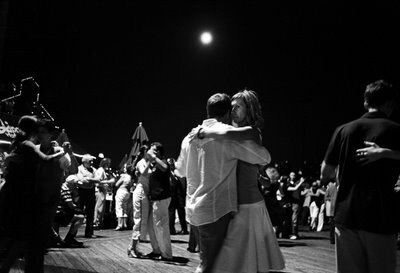 About two hours into it, however, I was pained when I saw that a beautiful full moon had begun to rise behind my camera. Over the next couple days all my time lapses were during daylight hours. But on the night they brought the dome down, I had looked up the moonrise time and came prepared to capture it from the opposite side of the dome. After a little trial and error and geometry guesswork, I was able to incorporate about three hours of the moon rising as the dome came down. The building of the dome can be watched here and the dismantling can be watched here. The next two weeks I spent in Europe. I noticed on a couple nights that the moon, as seen from Warsaw, Poland, was consistently much lower on the horizon–it never seemed to rise as high in the sky as it does in New York. One night the moon was so striking as it set over downtown Warsaw. We could only see it for a few seconds because we were in a taxi on a bridge and once we got off the bridge the buildings blocked the view of the moon. Back in New York I was determined to harness my newfound appreciation of the moon using time lapse. I poured over moonrise and moonset tables and sent them as text files to my Blackberry. I relished in deciphering which nights would be the best for capturing the moonrise or moonset. It didn't take long for me to become completely obsessed with the moon's whereabouts on any given time of any given day. Whenever I'd leave the apartment I'd immediately start looking for it. It was always rewarding to find it looking down at me through the daytime atmosphere. It's been fun to go through older pictures I've taken that feature the moon. One such image is the one above, showing the thin sliver of the moon in one of its early waxing crescent phases last October. 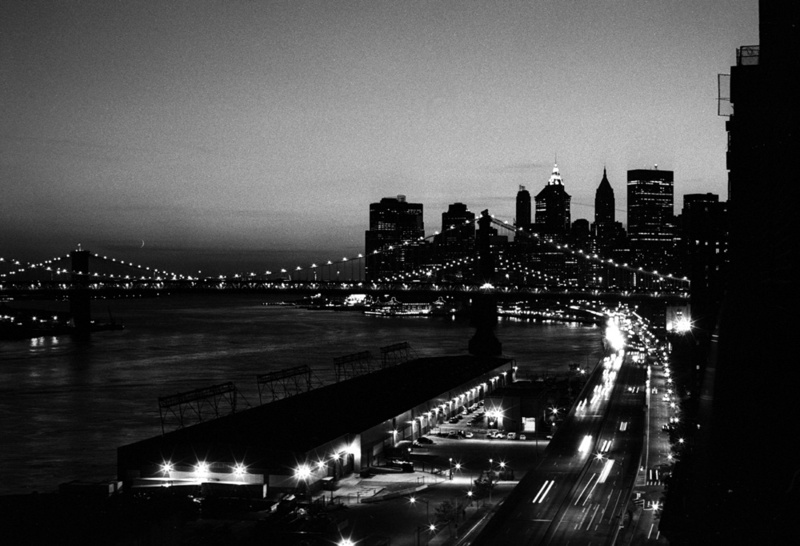 It's from a friend's balcony on the Lower East Side above the FDR. You can barely see it, it's on the far left side of the frame in the middle, just above the bridges. Click for a larger view. 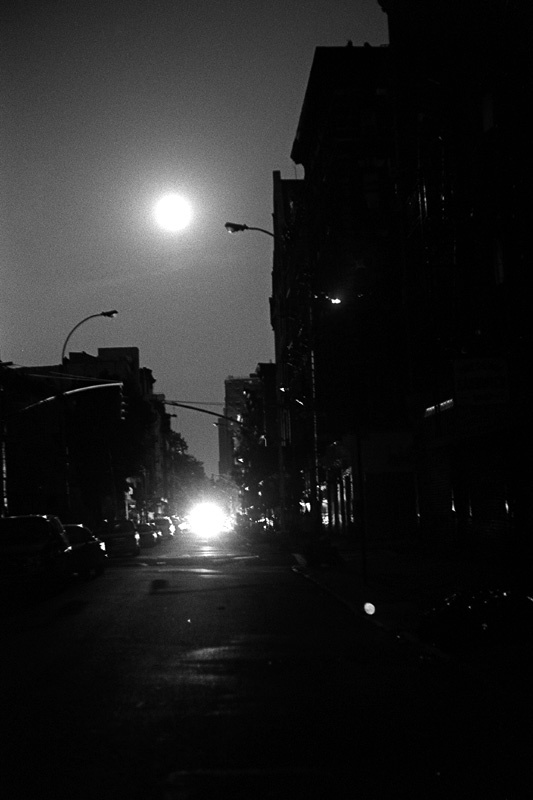 Below is a shot looking east on Rivington during the Blackout of 2003: As for my efforts actually capturing that moon via time lapse, I've had some success. But overall, I still have a ton of learning to do. I've got the timing aspect down pat. But where the moon is is much more tricky to determine than when it's visible. From one day to the next, it never rises or sets in the same spot. I guess a compass would help me figure this out. I have to keep reminding myself that it's earth's spinning on its own axis that results in the moon's "movement." But when I compare the moon's movement as relative to a star in the background–they don't move at the same pace–that's when the gears get going in my head. That's when you can see, over the course of a several-hour time lapse, that the moon is orbiting us at its own slowed-down pace. It makes me think of hands on a clock. Whenever the minute hand passes on top of the hour hand, it always takes place at a different spot on the clock. Such is the case with the moon–whenever it sets we're in a different part of our spin on our axis. 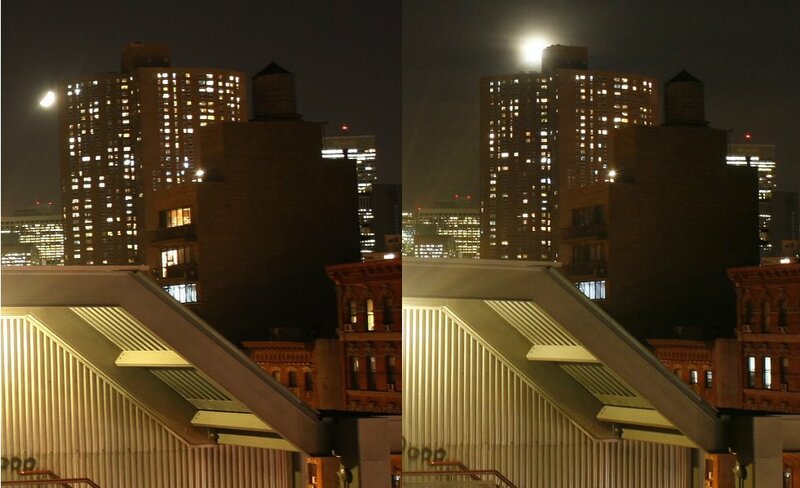 These images on the left show the difference in the moon's path from one night to the next. There's just a ton of moon science that I have taken for granted. For example, the lunar libration is something that totally fascinates me. Also, the interplay of the earth's and the moon's gravities, their barycenter, is equally interesting. The earth orbits around the sun at 30 kilometers per second (almost 67,000 miles per hour) whereas the moon orbits the earth at a mere 1 kilometer per second. I will leave you with the movie I put together this week showcasing the time lapse sequences I have done in September and October. I would guess it's around 30 hours of time lapse condensed into 2:23. The song is by Philip Sheppard, who wrote the score for the movie "In The Shadow Of The Moon," which I cannot recommend highly enough. The speech is from John F. Kennedy's address at Rice University September 12, 1962. It's also well worth your time. I've always said that I'm a complacent music listener. I have a great ear for music, and I know what I like, but I'm not somebody who walks around constantly plugged into an iPod. Far from it. My brother and I got guitars for Christmas in 1984, as well as guitar lessons from a man named Chuck Dooling. Nothing against Mr. Dooling, but I just wasn't into it at all. I think I probably lasted about four weeks before my mom realized that the lessons just weren't our cup of tea. About two and a half years later, however, I picked up the guitar again and started teaching myself, by ear. I remember the guitar lick from Poison's "Talk Dirty To Me" was one of the first riffs I taught myself. A few years later I was able to play along with pretty much every track off Nirvana's "Nevermind." In 1994 I bought an acoustic guitar, which I still play every once in a while. One of the first "real" songs I taught myself from start to finish was Beck's "Lazy Flies," off the 1998 album "Mutations." I say "real" because it involves a ton of wrist-cramping chord changes. So it was no surprise that when "Sea Change" (which features a ton of acoustic guitar playing) was released I started devouring those songs on my guitar. In February of 2003, after a last-minute announcement that Beck was to perform on SNL, I got the very last two tickets sold in Manhattan for a Valentine's Day show out at Maxwell's in Hoboken. Maxwell's is certainly one small venue, I think its occupancy is only 200 people. 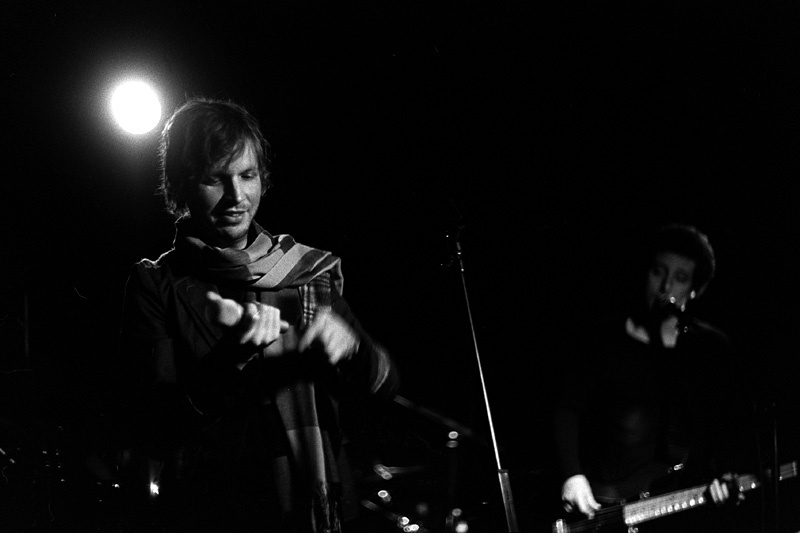 The photograph above is from that show, nearly all of which was comprised of songs off "Sea Change". Fast forward nearly six years later, to this past Wednesday night, at United Palace up on 175th and Broadway. 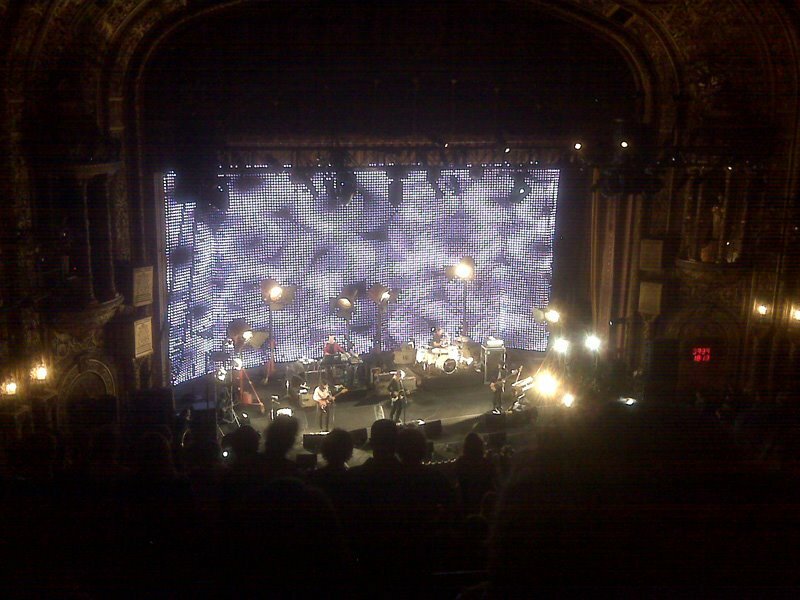 Yvonne and I went to go see Beck with our friend Mark Dantes and it was a really good time. I probably wouldn't have gotten the tickets on my own initiative but a different friend of ours was getting some and asked Yvonne if we'd like a pair. It was a totally different experience than 2003, a much heavier, rocking sound, and of course the elaborate setting that is the inside of UP's main theater was very impressive. Behind the band on stage was a giant curtain containing thousands of tiny LEDs that were synchronized and able to "project" moving images. It was pretty mesmerizing to watch. And the band's set list was quite varied to boot. For me it was quite interesting to take in how much Beck's repertoire has expanded since I last saw him. They played songs from every major album. They opened with "Loser," continued in that vein for a while before switching it up and gather at the front of the stage with headphones and electronic devices to play more "samply" digital stuff such as "Hell Yes" from "Guero" and "Where It's At" from "Odelay." Then they slowed it down and went into "The Golden Age" and other slower acoustic songs from "Sea Change" and elsewhere. I must confess, the one album I hadn't yet heard all the way through was his most recent, "Modern Guilt," and they played a fair amount from that, all of which sounded excellent. For their one encore performance they launched into two songs I hadn't heard, likely also from "Modern Guilt." But yet I felt there was something missing to the entire evening, a song that I couldn't believe they hadn't played yet. Thus, it was a no-brainer to end his show on it, and I immediately recognized it once the drummer started clapping his sticks together in a four-count lead into the impossible-to-miss riff from "E-Pro." 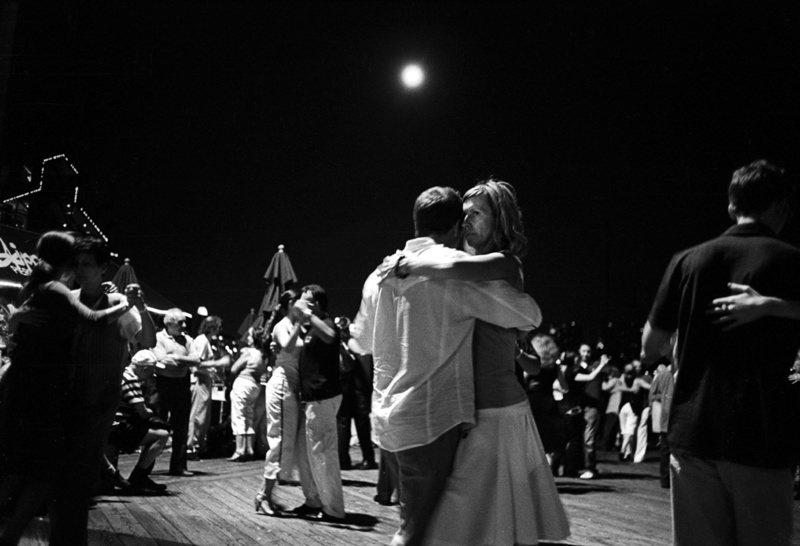 Notes from "The Legacy of Henri Cartier-Bresson"